The monk from the Escorial was no stranger to worldly joys: ever and again in his cembalo suites, Antonio Francisco Soler made the keys dance a veritable flamenco. That was back in the middle of the 18th century, but even today Soler’s compositions have lost none of their explosive force. Just the music for a pianist of flesh and blood, a musician with his heart in the right place and passion in his fingertips: Davide Cabassi, the highly esteemed virtuoso from Milan, award winner of the prestigious "G. B. Viotti" and "Van Cliburn" competitions and celebrated in all major international concert venues from the Carnegie Hall to the Münchner Philharmonie. 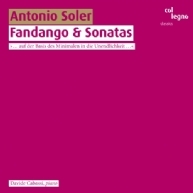 In his interpretation of Soler’s famous Fandango and several master sonatas, Cabassi consciously (and confidently) transforms brilliant cembalo music into the brilliant sound of a modern grand piano. The CD also contains a contemporary encounter with Soler’s universe: In Soler delirium, the Italian composer Libero Mureddu (*1975) joyfully plays with the power of Solerian motives and rhythms, inspired by an idea of Gustav Kuhn.